Two views of a life which, beyond its tragic end, continues to shine out in Church and world. Cardinal Kasper, president of the Pontifical Council for the Promotion of Christian Unity, sees in Brother Roger the symbol of spiritual ecumenism: nourished by prayer and contemplation, he was led to accomplish an inner reconciliation without repudiating anyone. 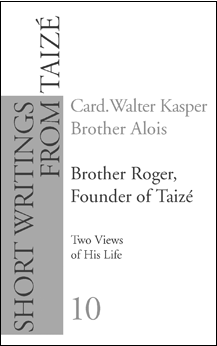 Brother Alois, who succeeded Brother Roger as prior of the community, shows how kindheartedness was in him a reflection of God’s love, and how he bore witness to that love particularly in his relations with young people.